The Lenovo G550 Series notebook is an extremely affordable laptop with good basic features for everyday tasks. It is powered by the Intel Celeron 900 processor with a 160 GB hard drive and 2 GD memory. It comes a 15.6 inch high definition LED backlight display that is widescreen at 16:9 aspect ratio. Furthermore, for graphics it uses the Intel Graphics Media Accelerator 4500M. Other features include an integrated web camera for video calls, high quality stereo speakers, a DVD reader and writer drive, and an integrated 802.11b/g wireless capability. It also comes installed with Windows 7 Home Premium 64 bit operating system. The Apple MacBook Pro comes with an Intel Core 2 Duo processor with a 2.4 GHz processor speed and 3 MB L2 cache. This gives you better multitasking Image by dansays via Flickrperformance and at the same time saves power and gives you significantly longer battery life. With a single charge, the battery can last up to 10 hours. 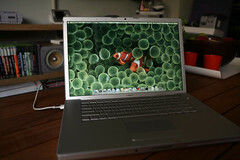 Additionally, you are able to fully charge and discharge it 1000 times, about 3 times that of typical notebook batteries. The MacBook Pro is also equipped with a 250 GB hard drive, 4 GB installed RAM that is expandable to 8 GB, a 8x SuperDrive with double-layer DVD support. As for graphics, it comes with the NVIDIA GeForce 320M graphics card providing you with high performance visuals whether you are watching videos, playing games or viewing photos.